We’ve got another non-farm payrolls report coming our way this Friday (Jan. 6, 1:30 pm GMT). And if you need to get up to speed on what happened last time and what’s expected this time, then gear up by reading up on today’s Forex Preview for the December non-farm payrolls report. Updated to include ISM’s non-manufacturing PMI report, the ADP report, and Markit’s revised services PMI report. Conclusion unchanged. Well, we got a slight downside surprise instead, since the U.S. economy only generated 178K non-farm jobs, which is slightly below the 180K consensus. 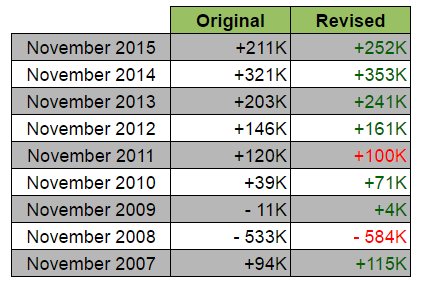 However, the 178K reading is indeed a bigger increase when compared to October’s downwardly revised 142K figure (+161K originally). Wage growth was also a disappointment, since average hourly earnings fell for the first time in nine months, contracting by 0.1% month-on-month. And while the jobless rate dropped from 4.9% to 4.6%, a low not seen since August 2007, the “improvement” was partially due to the total number of Americans not in the labor force increasing by a whopping 446K to a new record high of 95,055K. This then caused the labor force participation rate to slide lower from 62.8% to 62.7% and implies that many Americans got discouraged and called it quits. Overall, the November NFP report presented a mixed picture, and so the market also had a mixed interpretation and reaction. On the one hand, non-farm employment was above the 100K needed to keep up with working age-population growth, so expectations for a December rate hike got reinforced, with the probability of a December rate hike jumping from 92.7% to 97.2%. On the other hand, the drop in earnings and the slide in the labor force participation rate was taken as a sign that everything’s not A-okay, which eroded rate hike expectations for 2017. 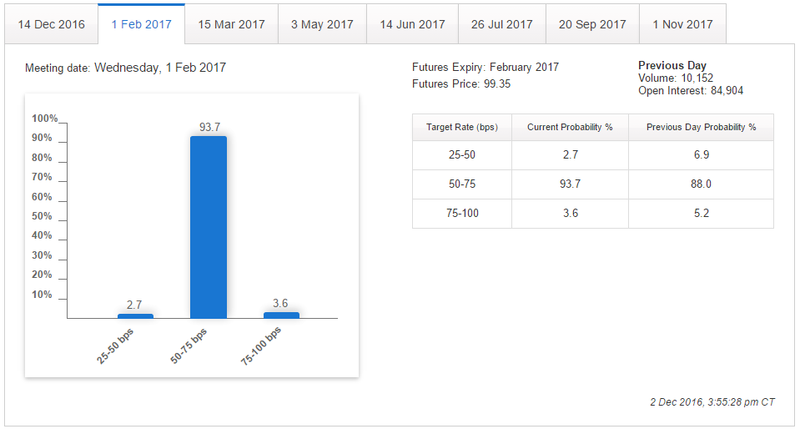 The probability for a follow-up rate hike during the February 2017 FOMC statement, for example, fell from 5.2% to 3.6%. And the Greenback’s price action reflected this mixed report, since bulls and bears had a game of tug-of-war in the wake of the NFP report. 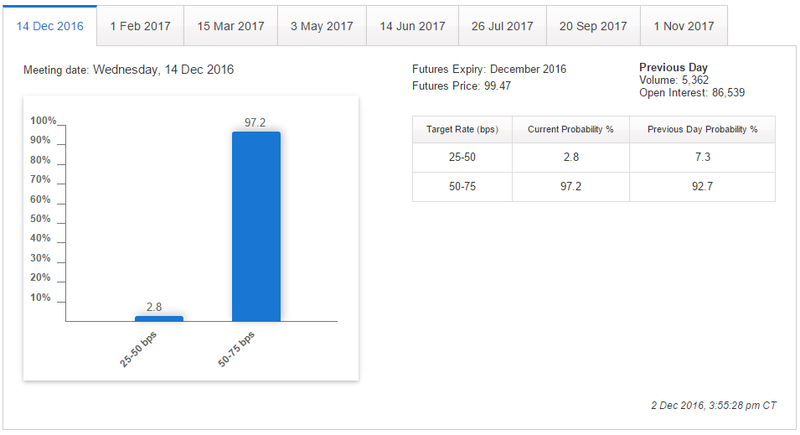 Although more market players were probably pricing in the lower rate hike expectations for 2017, since the Greenback began to slowly grind lower. For the employment situation in December, the consensus is that non-farm employment will increase by 175K, which is a bit weaker than November’s +178K but still well above the 100K needed to keep up with working-age population growth. However, the jobless rate in expected to deteriorate from 4.6% to 4.7%. Although it wouldn’t be too bad if the labor force participation rate also rose. Incidentally, the consensus that the December jobless rate would be 4.7% is in line with the Fed’s own projections. Average hourly earnings, meanwhile, are expected to accelerate by 0.3% after November’s disappointing 0.1% contraction. Looking at the available labor indicators, Markit’s final manufacturing PMI reading advanced from 54.1 to 54.3 in December. This is a 21-month high, which is awesome. And with regard to payroll numbers, commentary from the PMI report noted that “the latest increase in payroll numbers was the steepest recorded since June 2015,” which is also great news. Moving on, ISM’s manufacturing PMI jumped from 53.2 to a two-year high of 54.7 in December. The employment index for the manufacturing sector also rose, climbing higher from 52.3 to 53.1, which corroborates the commentary from Markit’s manufacturing PMI report. As for ISM’s non-manufacturing PMI, it held steady at 57.2, the highest reading since October 2015. However, the employment index for the non-manufacturing sector fell from 58.2 to 53.8. The details of the PMI report note, though, that 9 industries reported higher employment while 4 industries reported jobs losses, with the rest reporting steady employment levels. The industries that reported jobs growth include: Educational Services, Retail Trade, Finance & Insurance, Other Services, Construction, Accommodation & Food Services, Health Care & Social Assistance, Professional, Scientific & Technical Services, and Public Administration. Many of the aforementioned industries are labor intensive and all have been providing the bulk of the recent job gains. There is therefore a chance employment accelerated despite the weaker reading for the employment index. 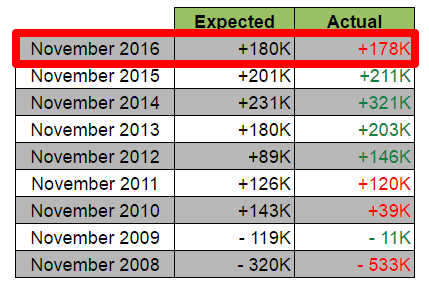 Anyhow, the only sore spot among the leading labor indicators was the ADP report, since it came in at 153K, which is less than the expected 171K, as well as the November’s upwardly revised 215K. Overall, the available leading indicators seem to be leaning heavily towards a larger increase in non-farm employment in December, which is contrary to expectations that non-farm employment in December will be slightly lower compared to November. Probability is therefore skewed more towards an upside surprise. 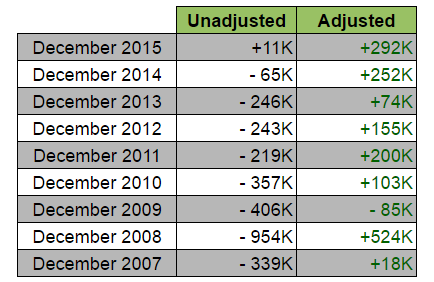 Looking at historical trends, the U.S. economy usually suffers job losses in December. Although seasonal adjustments mean that the seasonally-adjusted readings almost always end up being positive. However, market analysts tend to undershoot their forecasts, so there are slightly more upside surprises. In addition, seasonal adjustments mean that the reading for November usually gets an upgrade. As usual, just remember that an upside surprise for non-farm payrolls generally entices bulls to push the Greenback higher as a knee-jerk reaction while a downside surprise usually results in a quick Greenback selling spree. Also, keep in mind that follow-through selling is generally unlikely, as long as the reading is above the 100K “floor” that’s needed to keep up with working-age population growth, as well as keep rate hike expectations alive. Although that also depends on how other labor indicators fare, with wage growth in focus.